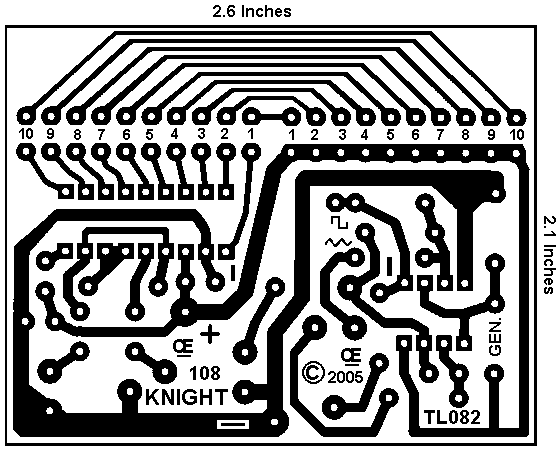 New Knight Rider Board, This Third and Best Circuit. 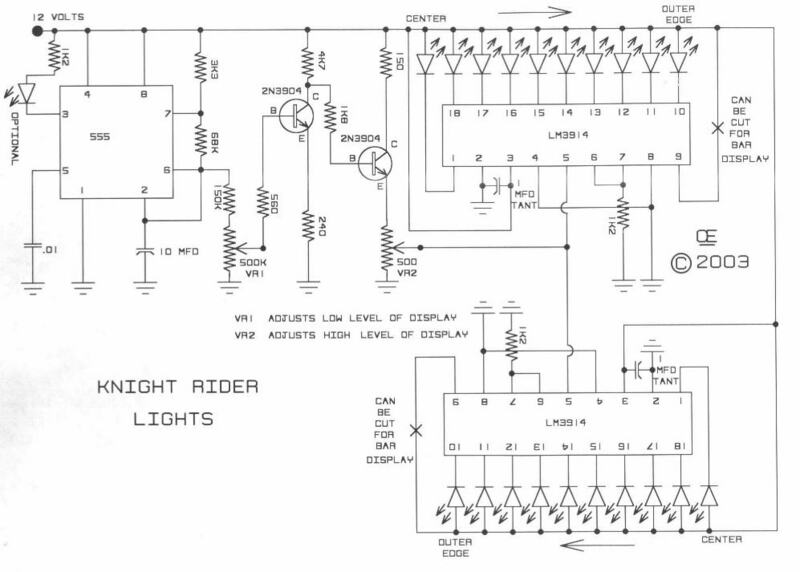 These circuits will give provide a Good Effect, duplicating the Knight Rider Lights, Plus more. on pin 2 of the 555. you can change Frequency. I suggest you maintain an Aproximate 50% duty cycle. This will give an Even Rise and Fall. But reducing down to 25% can give a reasonable effect also! In the Second Circuit, the range of Frequency Adjustment should be Quite Sufficient as presented. But the .47 cap can be changed in Value for other frequencies. and the Drive to the LM3914 is a more stable voltage with more current available. or Visa Versa. Resulting in Different Visual Effects. The TL082 (Or a TL072 also is OK) Creates an Adjustable Sawtooth Generator. 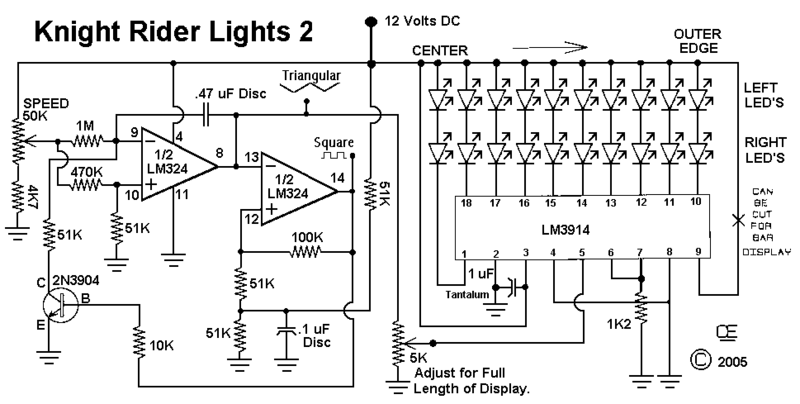 12 volt system, and if a person wanted to they could connect 2 LED's for each LED Shown. OFF Board if So Desired. 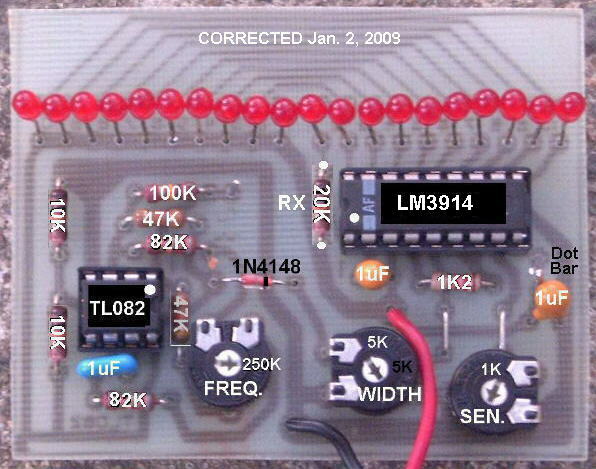 1) There is a 1K Pot that adjust the Voltage input to the LM3914. 2) There is a 5K pot that adjust the Output voltage of the Sawtooth Oscillator. 3) There is a 250K Pot to set the Frequency as Desired. 4) Additionally there is a Connection point between Pin 9 of the LM3914. Joining these together to creates a Bar Display. 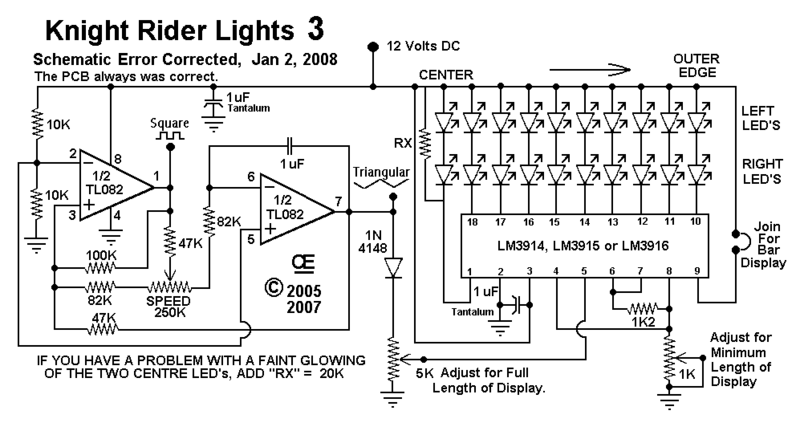 5) Substituting an LM3915 or an LM3916 will create a Non-Linear Effect in the Lights. Corrected Third Circuit, Parts Overlay Picture.